Aeroplan is running a promotion for points and miles transferred into the program until August 24, that has popped on a semi-predictable basis. The last time this ran was in April 2015. For the miles you transfer, you can earn up to a 27% bonus. Programs and partners which directly deposit into Aeroplan, such as the co-branded TD Aeroplan Visa Infinite, will not qualify. The more points you transfer, the larger the bonus gets. The last bonus is slightly higher than last time, which capped the bonus amount at 25% with 100,000 miles. Transfer only for the following partners are qualifying, with most being hotel programs. American Express Membership Rewards, unfortunately, is excluded. This Aeroplan transfer bonus is similar to previous times they’ve run the promotion. As such, I would not convert hotel points to Aeroplan since generally the conversion ratios are fairly poor, and you can often get a better value from using the points at hotels or transferring to other partners like Alaska or America. Aeroplan is one of the easiest currencies to earn in Canada, so there’s really no incentive to transfer other types of miles to Aeroplan. There are two opportunities where it may be worth considering. Starwood offers a 25% bonus on transfers of 20,000 points, equating to a 1:1.25 conversion rate. This stacks with the transfer promotion, meaning 80,000 SPG points will convert to 125,000 Aeroplan miles.If you are earning SPG points with the Starwood Preferred Guest American Express, which already offers a 20k bonus, that means you’re essentially earning 1.56 Aeroplan points if you transfer at that ratio. That’s enough to get you a round-trip in First Class to Europe, a good value especially if you combine it with a capped fuel surcharge trick when redeeming on Lufthansa First Class. It also might make sense to use this transfer bonus if topping up from an account where you had limited use for your hotel points. If you have a large amount of Marriott points, their Air and Flight packages are a good value in terms of the points to miles transfer ratio. 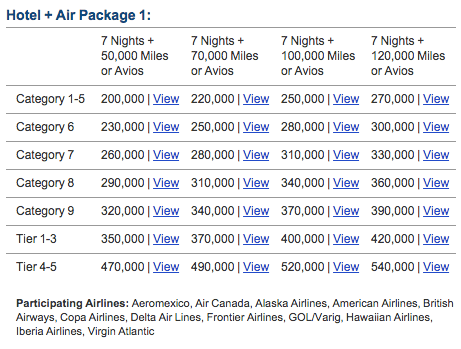 The packages range from 200,000 all the way to 540,000 miles. It only is worth transferring to Aeroplan if that is a currency you require and don’t have much of, while having lots of other types of miles and points. While Aeroplan has weak redemption levels in some circumstances, their good redemptions are still some of the best in the industry, such as North America to Europe 1 for 90,000 miles in business class and 125,000 miles in First Class, and 30,000 miles for certain Intra-Asia flights in business class. unrelated question- does the trick to minimize LH taxes/fuel charges still work ) from previous post last year ? Yes, if you’re referring to the capped fuel surcharge from certain departure areas. With the devaluation coming, do you expect AP to run this promotion again before the end of the year…? It’s possible. These promotions are seasonal, so generally they run at the same time every year. Was there one in the fall of 2014?